Brian McEniff and Jim McGuinness at Croke PArk after the All-Ireland final last September. SO JIM MCGUINNESS is heading for Glasgow with an exciting new role within Celtic’s youth academy. The only other man to lead Donegal to All-Ireland glory reckons McGuinness will make a success of his new job too. “Initially my reaction would be I’m very happy for Jim because he had no job really at this particular point in time,” said Brian McEniff today. ”His wife has been reduced to three days a week and he has three children under the age of five. “But saying that I’m disappointed we’re losing him on a full-time capacity. I gather he will be available to us in a part-time capacity so hopefully he’ll be fit to do what he can for us in that respect. But it’s a very very big commitment he’s taken on board,” added the manager of the victorious 1992 team from Tír Chonaill. McGuinness looks set to split his week between Scotland and Ireland with his assistant, Rory Gallagher, picking up some of the slack with the All-Ireland champions next season. “If anyone can work it, Jim can work it,” said McEniff on RTÉ radio earlier. “And I’m sure he’s thought it before he went over. It’s not an instantaneous decision. He’s been over and back to Celtic Park since the start of August when he went over there to view the situation. And it was kept low profile, naturally enough here within the county because we were looking at a bigger thing — winning an All-Ireland. Email “Brian McEniff: 'If anyone can work it, Jim McGuinness can'”. 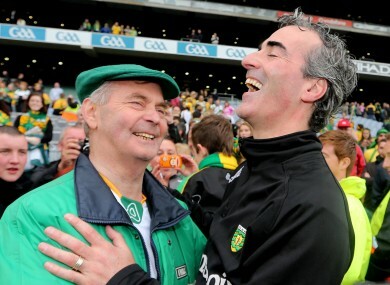 Feedback on “Brian McEniff: 'If anyone can work it, Jim McGuinness can'”.